Food service workers at Victoria International Airport (YYJ) represented by UNITE HERE Local 40 have ratified a new contract with the airport’s food service provider, Compass Group, by an overwhelming margin. The new agreement end the long, protracted labour dispute and addresses workers’ concerns about low pay and unreasonably high workloads due to understaffing. The workers, employed at YYJ’s White Spot, Tim Hortons, Starbucks, and Spinnakers on the Fly, will receive significant raises of up to 24% over the life of the agreement and retroactive bonuses. Most non-tipped workers will soon reach $15/hour by June 1 – well ahead of the BC Government’s scheduled minimum wage increases and ahead of most concession workers at competing airports, like Vancouver International Airport. The new agreement also establishes the first ever pension for food workers at YYJ and includes critical workload protections that will tackle understaffing. “This is a foundational contract that reflects the hard work our members put into their jobs every day. We can now attract experienced workers to help with the chronic under-staffing and to help our team succeed as our workplace grows,” said Mark Atkins, lead cook at Spinnakers on the Fly. Over the last 18 months, workers engaged in multiple job actions and demonstrations at YYJ. They were backed by the strong support of union allies, elected officials, community groups and passengers from the Greater Victoria region who demanded that contracted food workers at YYJ not be given second-class treatment. “For too long, I have felt that my work here at the airport was undervalued. The wage increases and benefits we will receive with this new contract are starting to change that, so that I can afford to stay here and do the work that I love,” said Karlene Kipling, a cook at Spinnakers on the Fly. The new contract will expire in 2020. YYJ’s contracted workers will continue to press the Victoria Airport Authority and the province to address contract flipping at airports and other institutions in B.C. 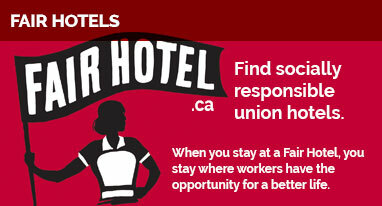 Nanaimo’s Coast Bastion Hotel Workers Ready to Strike Breaking: Coast Bastion Hotel Workers on Strike!